MainAll NewsUS & CanadaWatch: Was torching of 'Mitzvah bus' a hate crime? Watch: Was torching of 'Mitzvah bus' a hate crime? Iconic 'Mitzvah bus' in Brooklyn was targeted by vandals before going up in flames this week. Was arson an act of anti-Semitic hate? Earlier this week, the iconic ‘Mitzvah bus’ was torched in Brooklyn, raising concerns the vehicle may have targeted as a symbol of Jewish pride. The Mitzvah bus, a repurposed school bus used as both an art piece and a studio, was the creation of Crown Heights artist Lev Scheiber, who goes by the moniker “Leviticus”. When the bus was torched by unknown vandals Sunday night, Scheiber and other residents were shocked by the apparent act of hatred targeted at the local Jewish community. "When I got to the bus in the morning, to retrieve some art supplies, I found it completely charred," Scheiber told COLlive. 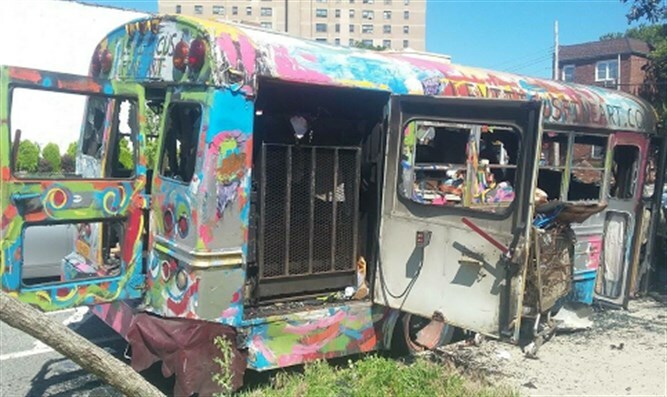 Singer Benny Friedman, who used the bus in his music video, expressed his shock that someone would torch it. Scheiber said he was unsure of the perpetrator’s motives, suggesting that the vandal or vandals might have been drawn by bus’ distinctive appearance. “My first instinct was it was targeted for some reason, maybe just because it’s a funny looking bus,” Scheiber told News 4 New York.